Love this. Wish I purchased more. It is light weight which it perfect year round. Love cotton which is hard to find but I tend to have allergies to synthetic fabrics. This is perfect for me hopefully the stock will be refilled. 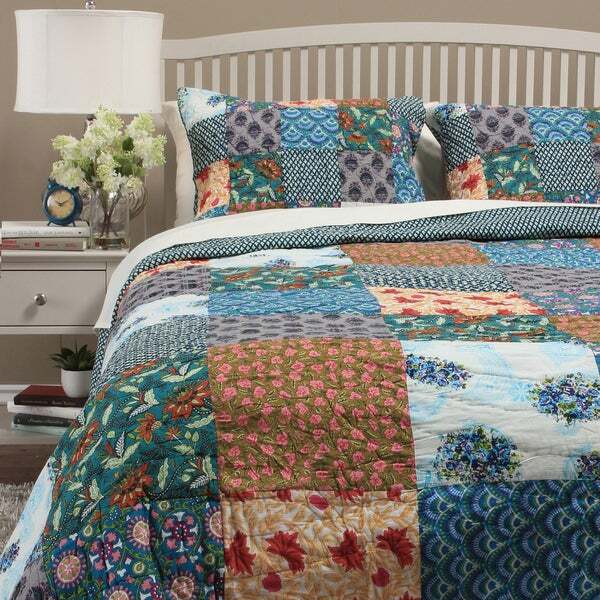 A multi-pattern, multicolored design lends eye-catching style to this beautiful patchwork quilt. Accented with matching shams, this cozy cotton quilt is backed with cotton voile and is fully machine washable. I love the colors in this quilt. True to what you see. It is not a thick quilt but okay with me. Soft to touch. Looks like it is made as well as anything else these days... I always fold back my quilts and just use the sheets and blanket anyway. Live in Texas! This will work for me. Had to re-sew the quilt and the pillow shams! Love the colours, and the material is good, but the quality is really poor. Had to sew some of the seams. VERY disappointed. This set is very attractive and of ample size. I love the vibrant colors.